I am a complete kid at heart! I love cartoons, I love cereal, and I love holidays! I love the decorations, the traditions, and of course the food! And Halloween is so much fun! It is fun to have a holiday that is all about being silly, candy, dressing up, and oh yeah creepy, crawly, scary things that can be cute too! 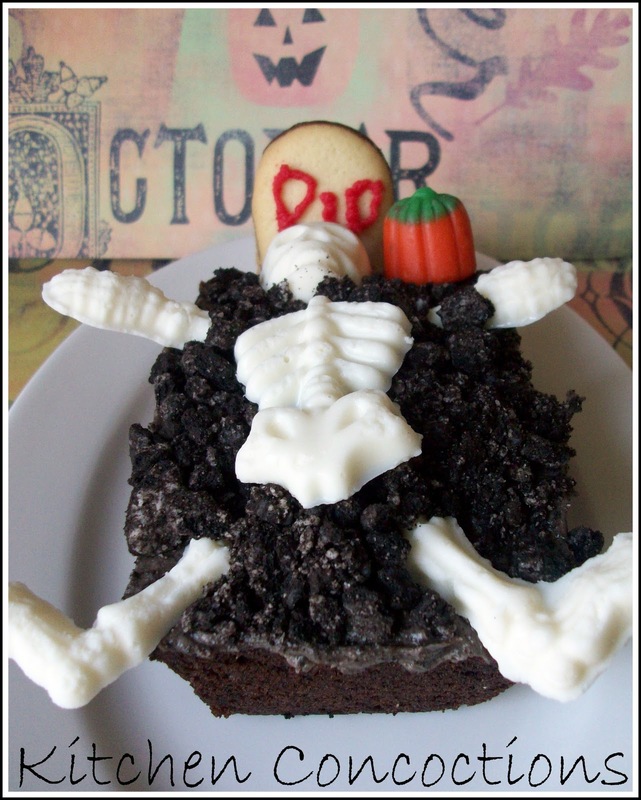 So this week to celebrate Halloween and all it’s funness; I will be sharing Halloween themed recipes! A week of ‘ghoulish grub’ of sorts! It should be a spooktacular good time! 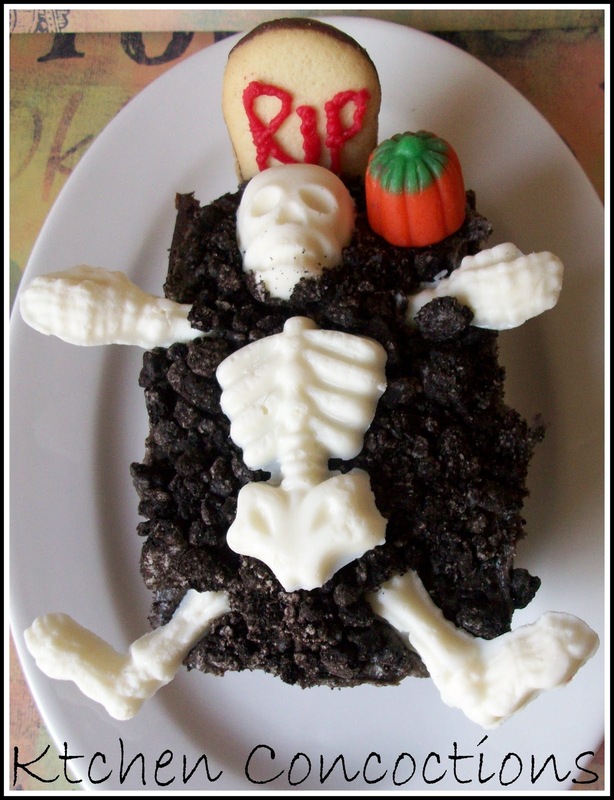 First fun thing up is not really a recipe but an idea; individual graveyard cakes. These were really easy to put together and I thought they turned out so cute! Notes: I found the skeleton candy mold at the craft store with all the other Halloween themed items. You can make your mini cakes as thick as you want and in what size pan you want. Make cake according to directions and bake in mini loaf pans until done, about 25 minutes or until toothpick inserted in middle comes out clean. While cakes are cooking, place white chocolate chips in microwave safe bowl and microwave for 15-20 seconds. Remove and stir until melted. Pour melted chocolate into skeleton candy molds. Let filled molds sit several hours or overnight to harden. Once cakes are cooled frost the top of cake with frosting. Sprinkle top of cake with cookie crumbs. Use decorator frosting to write on Milano cookies. Add candy skeleton pieces, prepared Milano cookie and candy corn pumpkin. Enjoy your scary treat!